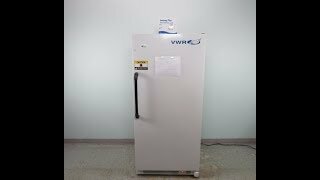 The VWR General Purpose -20 Freezer SCBMF 2020 addresses a lab's basic everyday freezer needs. This upright lab freezer is ideal for situations where precise control isn’t necessary, but quick access to samples and supplies is key. These general-purpose freezers from VWR are steady and reliable year after year with a temperature range that cycles around -20°C (-4°F). The interior of this lab freezer is 20 cu. ft. in capacity with 4 fixed level shelves as well as a basket for items at the base, and plenty of adjustable, in-door storage. The exterior of this lab freezer is steel with a corrosion resistant epoxy powder coat for easy clean up, and is lined with CFC free high density urethane foamed in insulation to help maintain temperatures. This VWR General Purpose -20 Freezer SCBMF 2020 has been thoroughly inspected and comes with current validation reports. All of our lan equipment comes backed with our standard warranty. Should you have any questions, please don't hesitate to contact us.